Red (again)!!! Apparently I am currently love the color red! I have been wearing it all of the time with out even thinking about it and I love this Anthro top! I recently got the new Anthro catalog and they have the cutest things and I want so many of them!! Okay these J.Brand jeans are currently on sale on ShopBop from $200 to only $62!!! They are final sale, but these jeans fit perfectly!! I recommend going up one size for J.Brand jeans! But this is such a good deal!! Oh and I am obsessed with this Olive and Piper necklace! Scroll down to enter the J.Crew giveaway! I am pretty sure everyone loves J.Crew! So I am so excited about todays giveaway!! Today I have teamed up with the lovely ladies below to bring you a chance to win $300 to J.Crew! Just follow the steps in the rafflecopter widget below... And make sure you check out all of these amazing ladies blogs! Good Luck!! The giveaway will end Wednesday, August 21 at 12 a.m. ET and is open to readers in the U.S. and Canada. You look gorgeous in red - I can see why you wear it so much! What a great giveaway! You look so pretty too. Love this! You look so comfy yet so polished. Red is such a gorgeous color on you Jade and this is an amazing giveaway... fingers crossed! I still love those shoes! Thanks for the giveaway opportunity! Love that top! Such great color! 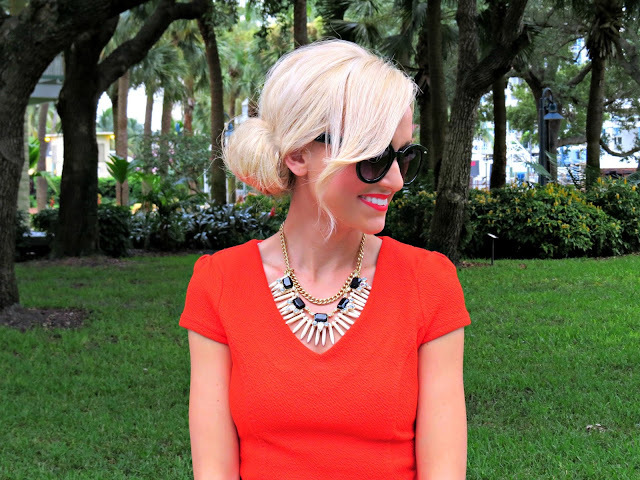 Love your low swept bun, such an easy workday do! Amazing look! J'adore that top! Your hair looks gorgeous in these pictures! Thank you for the giveaway as well! I've been looking for new blogs to follow so this is a perfect even if I don't win. Just came across your blog and absolutely LOVE it! So excited to now be following and see more posts to come! Just adore you hair in this post! Would love to figure out how to do mine like this - tutorial?